Bloomingdale | Park View, D.C. The Bloomingdale Civic Association is has organized a Historic Preservation Panel Discussion event for tonight at St. George’s Church (see flyer below). I’ll be there and expect this to be an interesting discussion. Others may want to check it out too. 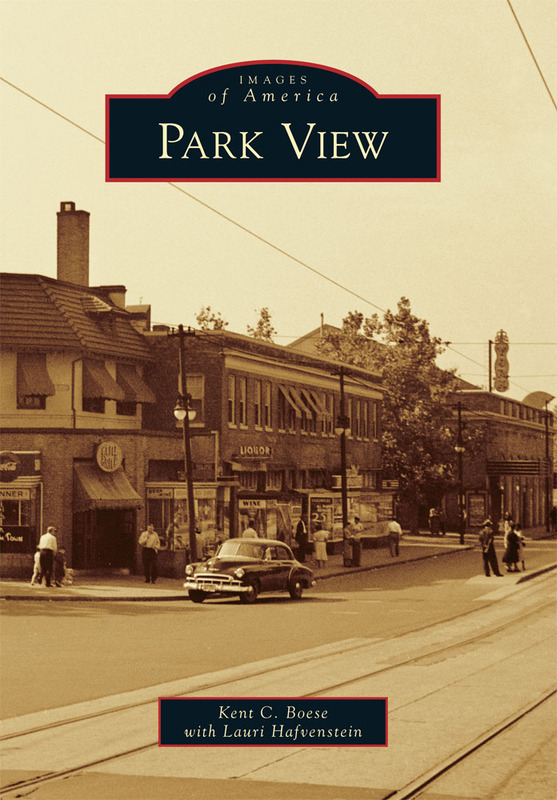 For those who can’t attend, or would like to know more about this topic and how it relates to Park View, I’m also in the process of organizing a similar event in Park View in the coming weeks. 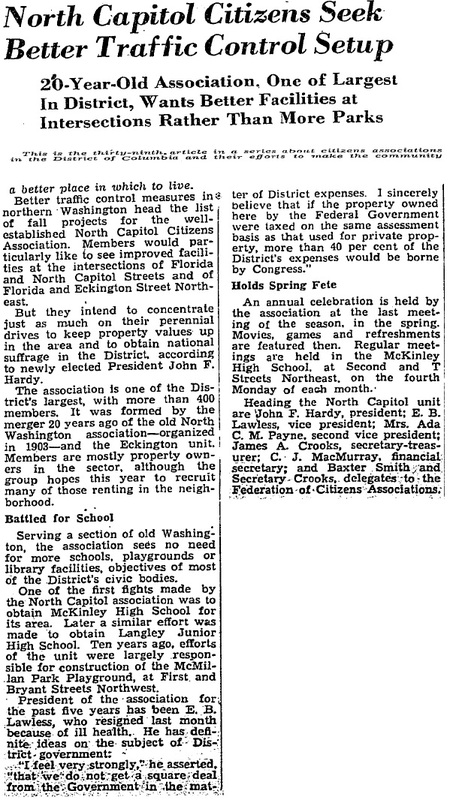 The next historic neighborhood civic group we’ll feature from the 1940s is the North Capitol Citizens’ Association. 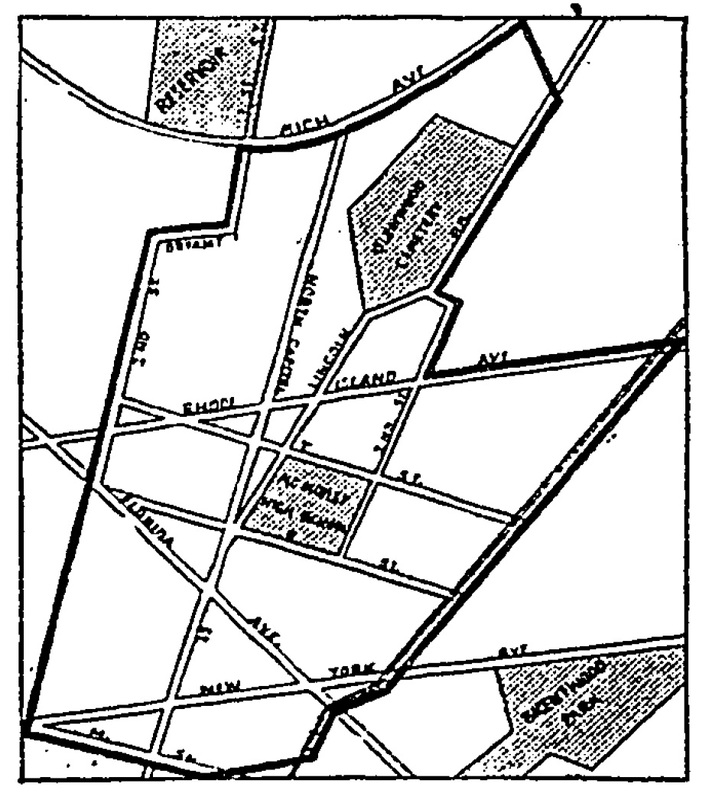 In looking at the map it appears to cover the Bloomingdale, Eckington, and Stronghold neighborhoods. In reading the article, I was particularly drawn to the article’s heading declaring that the association wanted better facilities at intersections rather than more parks. The article was originally published in the Washington Post on November 7, 1940. Recently, DC Water alerted me that they have an infrastructure project that will involve Irving Street east of Park Place. It will begin on November 25th and extend until April 2014. The project is intended to help reduce flooding in Bloomingdale. More information on the installation of the bioretention cells is available on DC Water’s project information sheet and posted below. 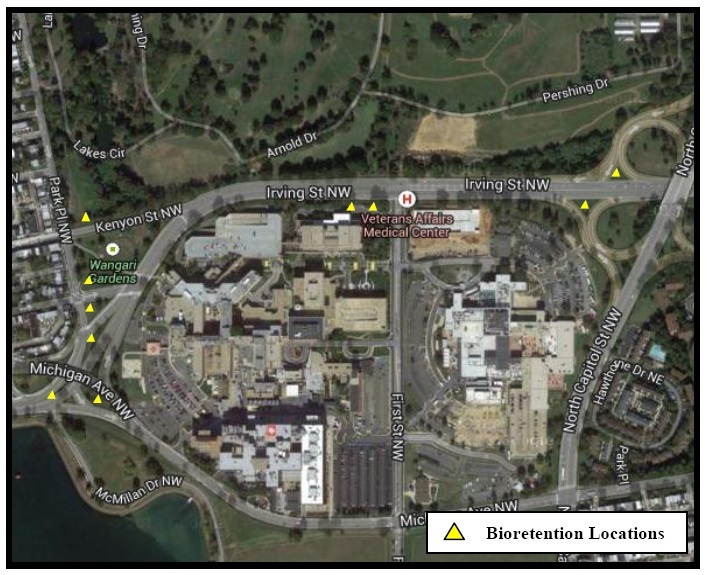 As part of DC Water’s Clean Rivers Project and medium-term flood mitigation efforts in the Bloomingdale neighborhood, we will be installing a series of bioretention cells along Irving Street, between Michigan Avenue and North Capitol Street. These cells will help reduce storm-water runoff through capture, infiltration and treatment before it enters the sewer system. The Irving Street Green Infrastructure project was previously discussed in conjunction with the First Street Tunnel Project during briefings with Councilmember McDuffie and presentations to ANC 5E, Bloomingdale and Stronghold Civic Associations. The proposed schedule of work for this project is November 2013 through April 2014, and much of the work will be performed during daytime hours, from 7:00am – 7:00pm. This and other important information on the project may be found on the attached project information sheet, which will be made available on DC Water’s website in the coming weeks. First Lady Grace Coolidge plants a tree at the Chevy Chase Playground, February 28, 1929. I’ve started doing research on District playgrounds so there’s a good chance that I’ll have a few posts about them in the near future. But for now, I’ll start with a historical side note that I stumbled upon related to playgrounds, trees, and presidential wives. Apparently, from 1928 to 1934, the Women’s City Club was successful in inviting siting and former First Ladies to attend their prominent tree planting ceremony. The first such tree planting occurred on May 1, 1928, at the Park View playground as part of the he District playground program that included 42 municipal playgrounds. At the Park View Playground, Mrs. William Howard Taft planted a red maple. According to the day’s program, during the exercises the school children danced around the tree singing the planting song. On February 28 of the following year, Mrs. Calvin Coolidge planted a tree at the Chevy Chase playgrounds as one of her last acts as First Lady. More than 1,000 persons witnessed the ceremony. Though this was the second such event at a District playground, it was described as an established custom by former First Ladies in their final days in the Capital before the inauguration of a new administration. Mrs. Woodrow Wilson was honored in 1930 with a tree planting at the Virginia Avenue Playground and Mrs. Herbert Hoover planted a willow oak on October 22, 1931, at the Mitchell Park Playground. After a two year break, Mrs. Franklin D. Roosevelt planted the last such tree that I’ve been able to track down on October 28, 1934. This tree was planted at the McMillan Playground (1st and Bryant). It’s possible that the tradition was interrupted by the Great Depression, or World War II, or that organizers had simply run out of presidential wives to honor. Whatever the reason, I like the idea and would be happy to see it come back. If you happen to be near the Armed Forces Retirement Home’s (AFRH) fence along Park Place today from 1-4 p.m. you should see it getting some TLC. 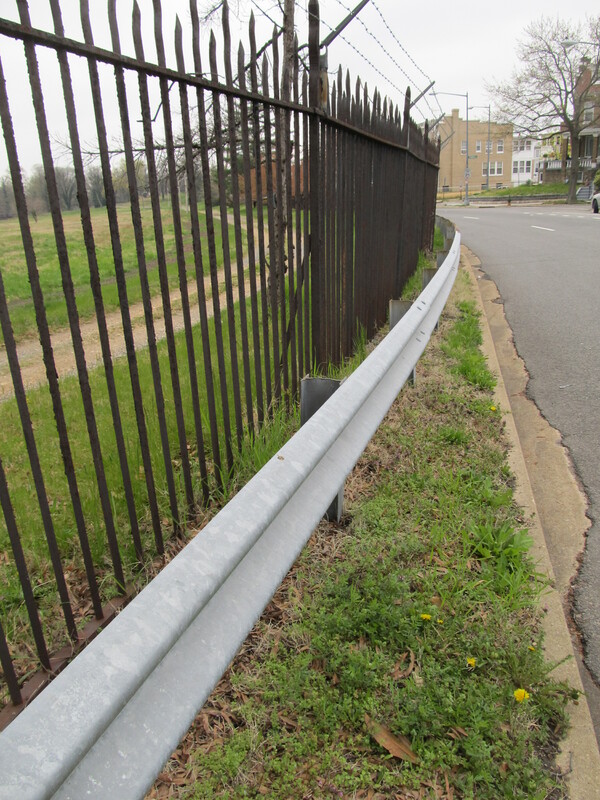 Greater DC Cares has chosen Veterans Day to help the AFRH fix up the fence. 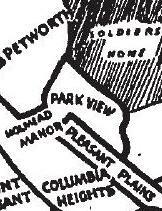 According to Adam Castle, the Greater Columbia Heights/Petworth Community Coordinator, DC Cares will have between 60 and 100 volunteers painting the perimeter fence this afternoon. Considering how much fence there is at the Soldiers’ Home, I’m sure 100 volunteers will be able to make some good progress. I’m also equally sure that there will be plenty of fence remaining for a future project … which brings me to my next topic … the kick off of a Friends of the AFRH Group. Last night a group of approximately 20 community members met to discuss the formation of a Friends of the AFRH group. The meeting included representatives from Park View, Petworth, Bloomingdale, and the AFRH (headed by Chief Operating Officer Steven G. McManus). Future meetings will help to better define the best ways to build a stronger relationship between the AFRH and the surrounding neighborhoods. The hard work of establishing the group is also needed … but for an inaugural meeting, it was as productive and mutually respectful as anyone could have hoped for. Have you wanted to visit the McMillan Sand Filtration Site but you keep missing out when it’s open to the public? Well, here’s another opportunity. It will be open this Saturday, October 29th, from 11:00 a.m.-3:00 p.m. Click on the image below for details on visiting. You can also click here to see photographs from the September 17th open house. 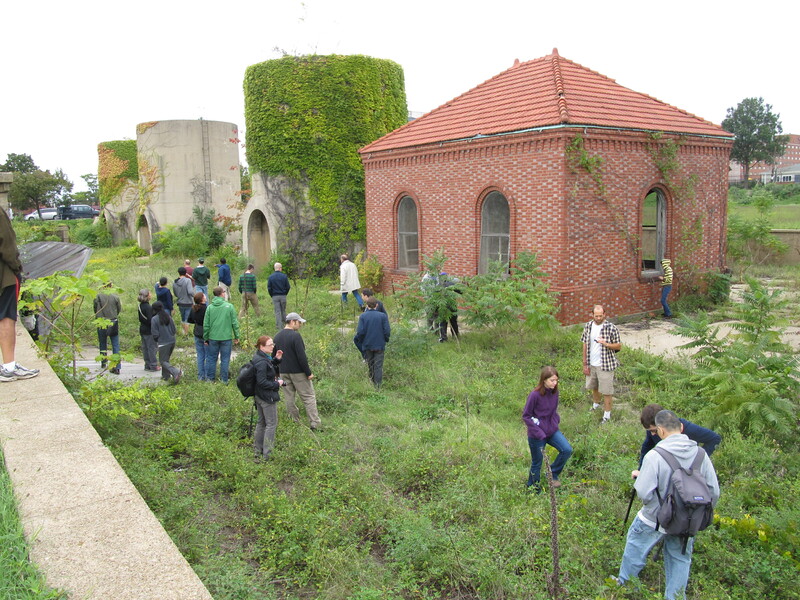 This past Saturday, September 17, the McMillan Sand Filtration site was open to visitors between 11:00 a.m. and 3:00 p.m. The tour was largely organized by John T. Salatti, Commissioner for ANC 5C04 and Vice President of the Bloomingdale Civic Association, although there were several ANC Commissioners and community activists there along with Ward 5 Councilmember Harry Thomas Jr. While I’m sure this was announced well enough in advance, I found out about it quite late. I’ll be sure to pass on any information I get, if I get enough notice, the next time the grounds are open to the public. The sand filtration site is one of those places that you just want to know more about. Future development of the site is difficult because the majority of the green space sits atop a vast network of sand filtration cells that were constructed of unreinforced concrete. I learned on the tour that such construction can last for years (the Roman Colosseum was built this way, commissioned in 72 AD), but it is not strong enough to build on top of. McMillan Park was also designated by the D.C. Historic Preservation Review Board as a Historic Landmark in 1991 and they nominated the site for the National Register of Historic Places as well. Wikipedia has a good article on McMillan Park and its history which you can read for additional information.